The look and feel of a real bullet! 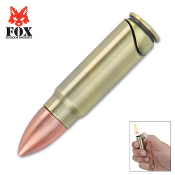 But, instead of lead this handy lighter shoots out a blazing torch flame. Lightweight and handy.